There are dozens of emerging space nations around the world seeking to capitalize on dramatic increases in space technology accessibility. We take a look at one such nation, the United Arab Emirates, exploring the opportunities and challenges they face on the road to achieving space capability. Entry of the United Arab Emirates (UAE) into the Space Age occurred in the 1990s prompted by an interest in enhancing national capacity to effectively create, use, and exploit space science technologies and applications. In 2006, a UAE government decree by His Highness Sheikh Mohammed bin Rashid Al Maktoum, UAE Vice President, Prime Minister and Ruler of Dubai, established the Emirates Institution for Advanced Science and Technology (EIAST). The step signalled the nation’s commitment to developing excellence within the space industry. EIAST was established as part of a strategic initiative to promote scientific innovation and space technology advancement, and to inspire sustainable development in the UAE. American astronaut Buzz Aldrin, speaking at the April 2014 Global Aerospace Summit in Abu Dhabi, expressed his opinion that the UAE will play a role in the next stage of space exploration as the country’s industry moves from being government policy-driven to commercial development-driven. A renovated 2142 square meter floor area Admin Building of the Emirates Institution for Advanced Science and Technology (EIAST) based in Al Khawaneej, Dubai, UAE (Credits: EIAST). 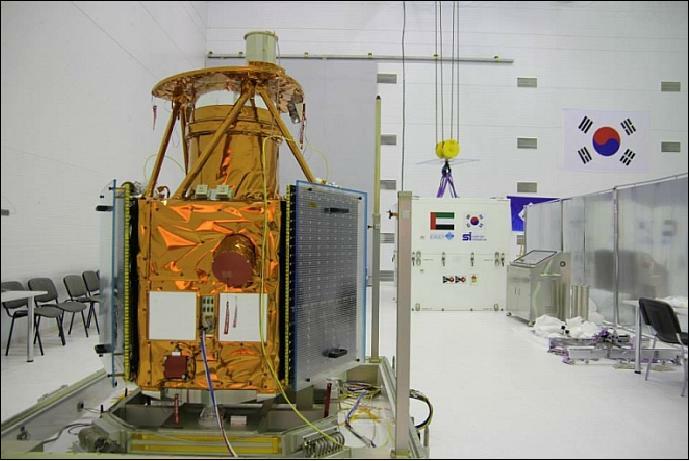 EIAST became the first Dubai government entity to own an Earth observation satellite in orbit when DubaiSat-1 was launched in July 2009, following three years of joint development between EIAST and South Korea-based Satrec Initiative (SI). In developing DubaiSat-1, EIAST’s goal was to engage in a scientific knowledge and technology transfer program to jumpstart the institute’s satellite projects. 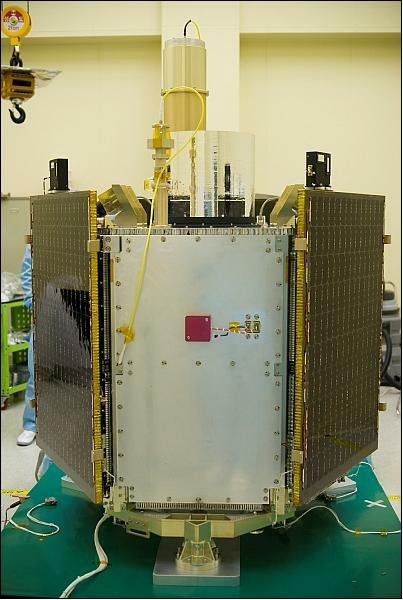 DubaiSat-1 was followed by another three-year joint development of a more advanced imaging Earth observation spacecraft, DubaiSat-2, launched into orbit in November 2013. During its development, EIAST engineers took the lead to design mission requirements and develop a higher imaging resolution system and advanced components, supported by South Korean experts. Both satellites have a 5-year design life and are currently nominally operational in their orbits. Launched from the Baikonur launch site in Kazakhstan aboard the Dnepr vehicle of the Russian International Space Company Kosmotras in Moscow on 29 July 2009, DubaiSat-1 flies in a descending Sun-synchronous near-circular orbit (North to South), at 686-km altitude above the Earth’s surface, and goes round the Earth about sixteen times a day. DubaiSat-2 flies in an ascending Sun-synchronous near-circular orbit (South to North), at 600-km altitude, with about 8-day effective revisit time for any ground location with spacecraft body-pointing capability. The altitudes, orbits, and revisit times allow both satellites to work well in constellation and give a better coverage of the UAE. In March 2014, the EIAST team started conceptualization of its third and most technologically advanced Earth imaging satellite DubaiSat-3, dubbed KhalifaSat after the UAE President, His Highness Sheikh Khalifa Bin Zayed Al Nahyan. Projected for launch in 2017, KhalifaSat will be one of the smallest satellites in the world capable of providing sub-meter images. The project is the culmination of a three-step approach intended to achieve full capabilities, knowledge, facilities, and research ability to develop advanced satellite missions by Emirati scientists and engineers on UAE soil. When launched, the success of KhalifaSat would represent a shift in UAE’s economy from being dependent on importing space technologies to in-house development. EIAST is made up of a core team of 27 Emeriti engineers who are working to position their country as a player in the global space industry. Amer Mohammed Al Sayegh, an aerospace engineer, is Senior Director of Space Systems Development Department at EIAST. He joined the institute in 2005, participated in its knowledge transfer program, and remains a key figure in the development of EIAST satellite projects. Sayegh contributed to the development of the Attitude Control System for DubaiSat-1, managed system-level engineering, and developed an agile Attitude Control System for DubaiSat-2. He is currently the Project Manager for the KhalifaSat project. Space Safety Magazine contacted Eng. Amer Al Sayegh to get some insight into EIAST development since 2006. Ongoing construction of EIAST Primary Facility for the manufacture of satellites is expected to be complete in the second quarter of 2015. The facility comprises a clean room for the manufacture of satellites, an electrical laboratory, as well as a mechanical lab. With a total area of 210.25 square meters, this primary facility is the first phase of a bigger development dedicated to manufacture satellites at the institution (Credits: nikoladakic.com). Structural photo of the 200-Kg DubaiSat-1 imaging microsatellite, a cylindrical body of hexagonal shape, showing two of its three deployable solar panels in manufacturing room of Satrec Initiative, Daejeon, South Korea (Credits: EIAST). For decades, developed countries have relied on satellite-based services to support informed decision making processes, policy implementation, and compliance monitoring in all sectors of society. “EIAST civil land imaging spacecraft is increasingly successful and could soon become popular because it is a proven policy instrument and access to space capabilities is affordable,” says Sayegh. “The need for scientific data and images as leveraging instruments in monitoring compliance of social, economic, and security policies is one of the reasons why Earth observation is EIAST’s primary mission of choice.” The UAE Government invests primarily in EIAST Earth observation projects, although other satellite applications are part of the institute’s space project portfolio. To illustrate how EIAST’s Earth observation is yielding short term benefits, Sayegh asserts that imaging instruments on DubaiSat-1 and DubaiSat-2 are being used “to protect forests, plan urban growth, harness water resources, manage coastal zones, plan and manage crises.” The DubaiSat-1 imaging system had recorded more than 10,000 images of the globe as of December 2012. Using the images, analysts can zoom into selected areas worldwide and identify car-sized objects at almost any time, similar to the resolution of images typically seen on Google Maps. 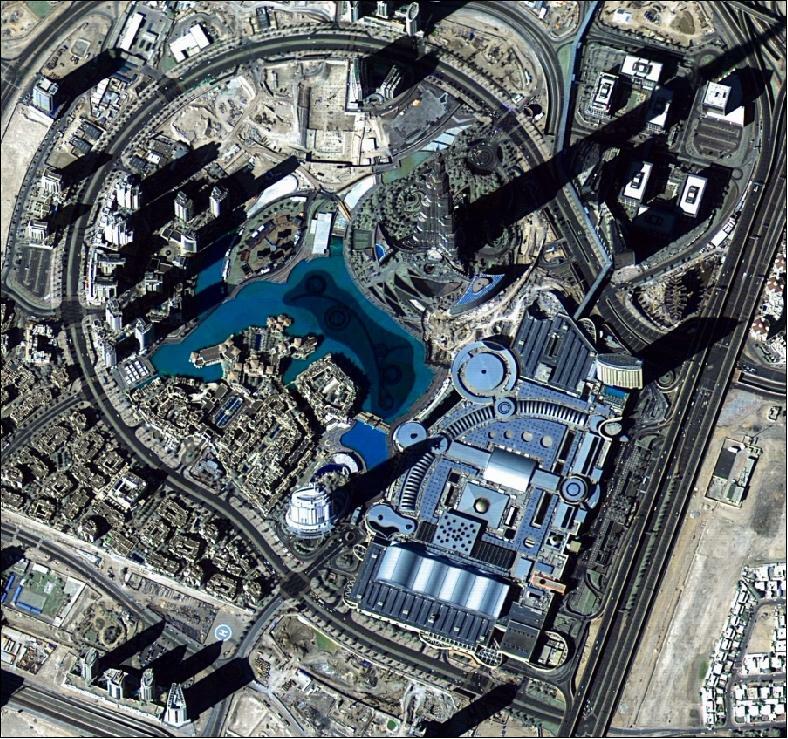 “DubaiSat-1 and DubaiSat-2 images are used, for example, to make study cases of the continuous development that is happening in the city of Dubai; we provide regular images to developers to monitor the progress of their projects,” Sayegh relates. “DubaiSat-1 images were used by governments and organizations in making decisions to provide emergency services and to monitor crises including the 2010 floods in Pakistan, 2010 Chilean mine collapse, and 2011 Japanese tsunami”; although UAE is not yet a member of the International Charter Space and Major Disasters, an international stature only available through satellites. Sayegh’s perspective concurs with the established view that Earth observation missions enhance socio-economic development of countries, with benefits for user populations, various industry sectors, education, and research. While Earth observation is clearly useful to UAE’s operation, there are also benefits to be reaped from telecommunication and navigation space assets. EIAST is starting with Earth observation, because the barriers are much lower in terms of complexity and launch costs. The agency relies on foreign rockets to hoist its spacecraft, so sticking to low-mass missions allows EIAST to take advantage of secondary launch opportunities. For instance, “the less than 200-kg DubaiSat-1 spacecraft was launched under a shared manifest with three other piggy-back satellites onboard Dnepr launch vehicle of the Russian International Space Company (ISC),” Sayegh explains. “The subsequent launch of DubaiSat-2, less than 300-kg, was also under a shared manifest with more than 20 other small satellites,” he adds. Earth observation missions use mostly COTS products whose integration is relatively easy because the functions are comparatively basic and less technologically demanding than other applications. Earth observation satellites are the lowest cost missions because cost of all mission elements is minimized. For Earth Observation space segments, “the promise of low-cost small satellite missions is based on this approach—low-cost sensors accommodated on low-cost small satellite buses and launched on low-cost small launch vehicles,” Sayegh explains. “Thus, low-cost sensors that can be accommodated on these smaller satellite buses and launch vehicles can be flown as low-cost small missions.” For EIAST and similar emerging space programs, the low-cost of shared launch manifests of small satellites, the established low-cost platform and single-function Earth observation spacecraft improves access to space capabilities. The nearly 300-kg DubaiSat-2 remote sensing minisatellite in a clean room at the Dombarovsky (Yasny Cosmodrome) launch site in Russia ready to be mounted on a launch vehicle (Credits: SI, EIAST). EIAST has used its international partnerships to get UAE space program off the ground. Sayegh says that EIASTstrategic partnership with the South Korean Satrec Initiative in Daejeon has resulted in space science knowledge and technology transfer to UAE scientists and experts. This has been done through technical assistance, which takes many forms, including instruction, consulting services, engineering designs and specifications, skills. training, blueprints, plans, models, formulae, diagrams, working knowledge, and manuals.”. With two satellites under their belt in less than a decade of collaboration, the training is starting to pay off. In May 2014, for example, Eng. 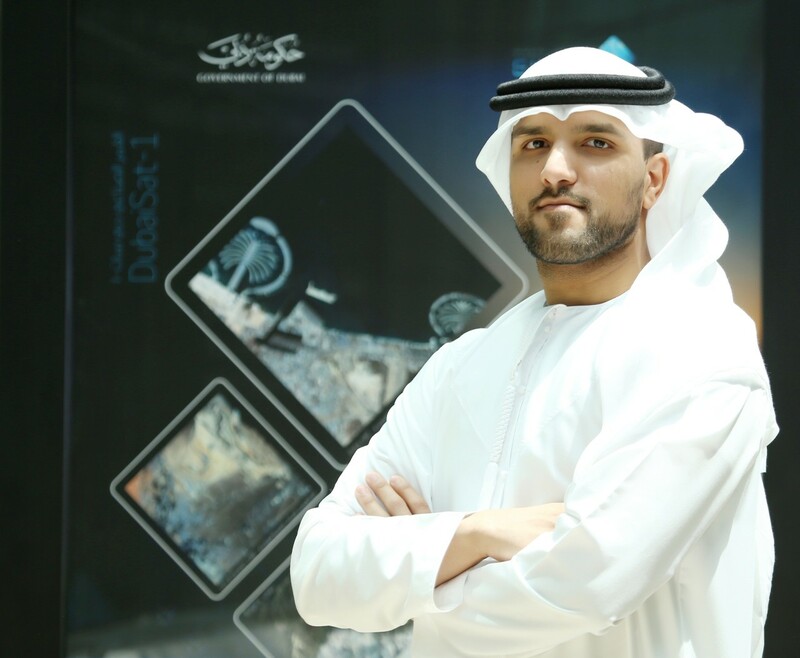 Saeed Al Mansoori at EIAST’s Centre of Application and Analysis Development Project launched his result of a “Super Resolution Tool” that boosts and enhances the resolution of satellite images – including those taken by DubaiSat-2 – by 0.75 meters. Super-resolution is a mathematical term used by scientists. Work on the topic was first published in 1984, but the concept gained prominence around 1990. Increasingly, limitations in satellite data applications have shifted from the technology of acquiring the data to the techniques on the ground required to optimally exploit the information within the remotely sensed data. Saeed’s result could offer a low cost solution in achieving high resolution satellite applications using archived low resolution remote sensing data. “The innovative tool significantly improves the image clarity and detail by increasing the number of pixels when zoomed in,” Sayegh says in an EIAST press release. “This subsequently enhances the degree of contrast and highlights the edges and borders that represent infrastructures, roads, and buildings.” This achievement indicates EIAST is capable of achieving scientific innovation, which is one of the basic pillars of the future UAE space program. The partnership between EIAST and Satrec Initiative has been a prime example of the use and transfer of established, cost-effective, and low risk space technology. Engineer Amer Mohammed Al Sayegh, Senior Director of Space Systems Development Department at EIAST (Credits: EIAST). Initial tasks regarding the design of the engineering model, also called initial development, of KhalifaSat are done in South Korea and are expected to last two years. In early 2016, the project will be transferred to Dubai where Emirati scientists and engineers will start developing the flight model of the spacecraft in UAE facilities, which are currently being constructed to host the next phase of the project. 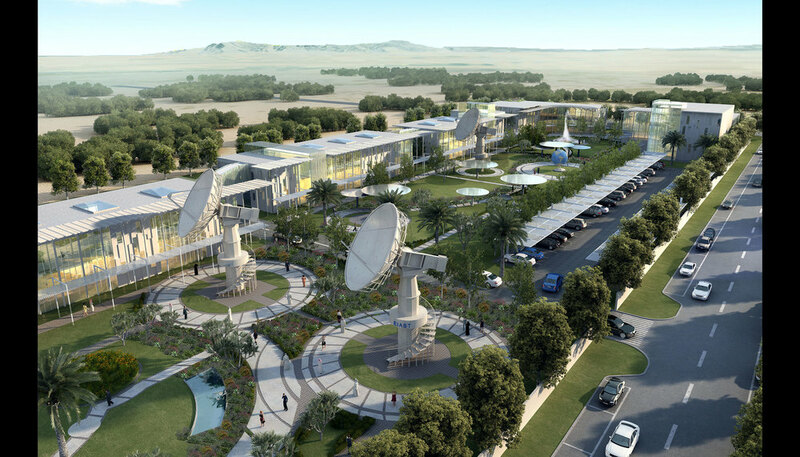 The construction of EIAST’s primary facility for the manufacture of satellites is ongoing and expected to be complete in the second quarter of 2015. “We are creating the research and development facilities at our headquarters in Dubai to enable our team to achieve the institution’s goals independently of external input, building a sustainable knowledge economy that will help to drive the UAE forward over the coming years,” Sayegh states. “Our built ground station at EIAST is currently used for DubaiSat-1 and DubaiSat-2 operations; maintenance and upgrades are carried our annually to improve its capabilities.” So far, the success of the UAE space development path suggest that one workable model for emerging space countries to ensure that an investment strategy in buying the space infrastructure is equally embedded into technology and service development is to integrate their Earth observation missions with a national aerospace plan. 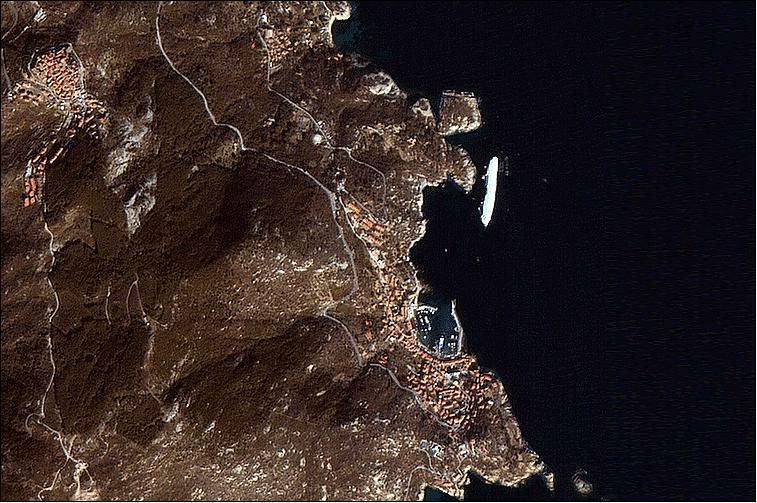 DubaiSat-1 image of the Costa Concordia cruise liner that partially sank on January 13, 2012 off the Italian coast of Giglio island, located off the coast of Tuscany (Credits: EIAST). Programmatic management in an emerging small space agency like EIAST is quite different from that of a large established space program like NASA. EIAST’s innovative management approaches help the emerging space program realize the many benefits of a small satellite approach, which include shortened development times, low integrated cost, and large technical performance. One such approach is “insight versus oversight.” Under this approach, EIAST’s insight as part of the development team limited the need for oversight by reducing the number of formal documents and reports that the South Korean contractors had to deliver to those that truly added value. It also limited the number of formal reviews for DubaiSat-1 and DubaiSat-2 missions; just enough to allow a knowledgeable engineer or manager to evaluate progress and risks. 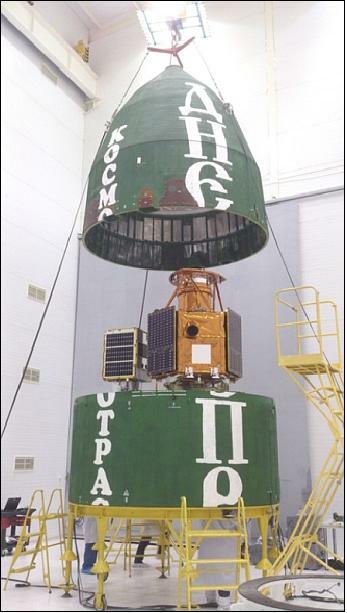 Integration photo of the primary payloads into the upper platform of the Dnepr fairing launch vehicle at the Dombarovsky (Yasny Cosmodrome) launch site in Russia. The larger minisatellite, is DubaiSat-2 Earth imaging spacecraft featuring two of its three deployable solar panels (Credits: ISC Kosmotras). “On average over 2,000-page material at a cost of several person-years of effort were produced for a single major review while building DubaiSat-1 payload system beginning in 2006 and ending in 2009,” Sayegh relates. Comparatively, over 5,000-page material at a cost of several-person years of effort was produced for a single major review during the building of the NASA’s Earth Observing System Data and Information System (EOSDIS) core system, beginning in the early 80’s and ending in 1999. EIAST’s streamlined approach for DubaiSat-1 resulted in a total development timeline of just four years. As of June 30, the Dubai Government has invested approximately $5.9 billion in space technology. For example, DubaiSat-1 and DubaiSat-2 projects jointly cost less than US$ 50 million. Sayegh explains that the Government investment is aimed at diversifying the country’s economy and building up its local talent in the fields of technology and aerospace. 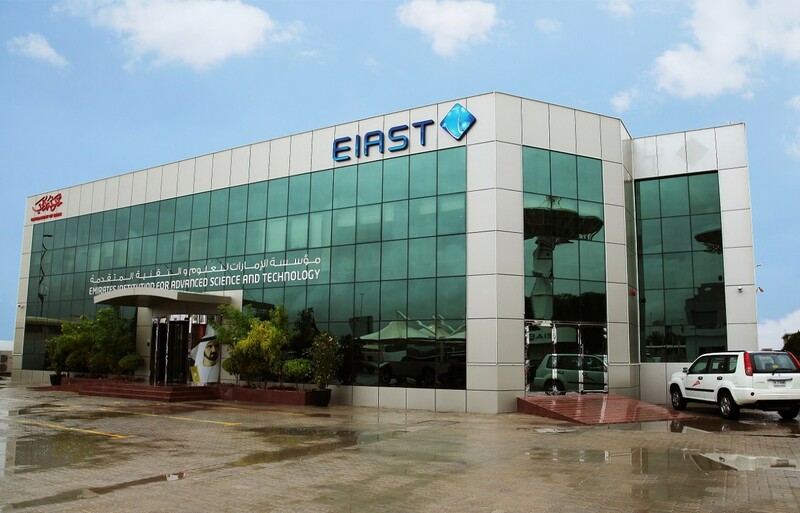 Building on experiences in the UAE’s commercial manufacturing industry is another management style that EIAST uses to achieve integrated cost and large technical performance. Under this approach, EIAST relies more heavily on integrated product development teams rather than dividing the effort into separate mission components as is typically done in a large agency like NASA. DubaiSat-2 image of Downtown Dubai with the Burj Khalifa (upper half center with the longest shadow to the north-east corner), the Burj Khalifa is the tallest building in the world with 828 m and more than 160 stories. The 1 m resolution image was acquired just before National Day on December 1, 2013 (Credits: EIAST). As of December 2013, over 60 countries were operating satellites in space. In the last decade, many countries including Armenia, Ghana, Kenya, Sri Lanka, and Turkmenistan, and the UAE made the decision to invest in space technology or acquire their first satellite. As a result, the space sector has witnessed the emergence of national space activities in many regions of the world – Sub-Saharan Africa, North Africa and the Middle East, Latin America, all over Asia, and Central and Eastern Europe. These emerging space powers are investing in first- or second-generation satellites. They share the same mix of motivations that spurred the Soviet Union and the United States to enter space back in the late 1950s – national pride, autonomy, national security, and in the 21st century, commercial opportunities. These countries are taking advantage of international cooperation with advanced space nations as exemplified in the UAE-South Korea partnership. More important, emerging space powers such as Brazil, Kenya, Malaysia, Indonesia, and Australia have the potential to become lucrative launching states. A 2013 EIAST concept design by Nikola Dakic of U+A Architects in Dubai, UAE. The design comprises renovated Admin Building and Training and Research Center buildings and a new Café and Exhibition Center, Space Program and Image Processing Unit, Satellite Manufacture, and Auditorium (Credits: nikoladakic.com). In the next decade, we can expect to see significant implications for the aerospace industry throughout the global satellite sector. We are witnessing activities of space industry entrants in Brazil, Singapore, South Korea, and the United Arab Emirates. When other capability-building emerging powers like Nigeria and the UAE mature, many space enterprises will arise as they arisen in South Africa and South Korea. Dramatic increases in space technology accessibility will enable these emerging industries to technologically leapfrog and catch up with industry in established space powers. The spread of small satellites and globalization will continue to lower technological and economic barriers to enter space; we could see even more new countries around the world start up space activities. The UAE has an exceptional potential to become a mature emerging space power. The energy-rich country has the financial resources, the technical know-how, and the national will necessary to launch an ambitious space program. Equally important, the Dubai Government has socio-economic and geo-strategic motivations to enter space. First, the Government regards a national space program playing a big part in the drive to diversify the Emirati economy, creating highly skilled and high paying technology jobs, and by inference, a highly skilled and high tech workforce. 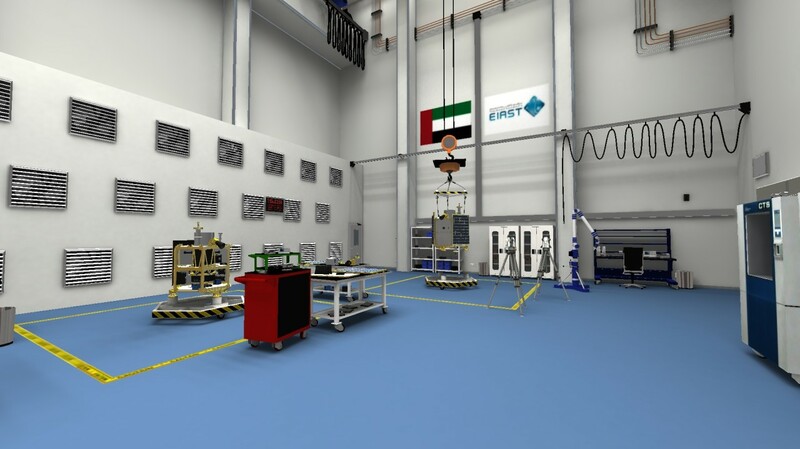 Along these lines, EIAST built its space program on localized space technologies, empowering UAE scientists and engineers, focusing on knowledge transfer, and establishing local infrastructure including labs, facilities, and education centers. Another motivation of the Dubai Government to enter space is rooted in the geography and strategic location of the UAE as well as its crucial position in the Arabian Gulf. Space technology enables the UAE to take advantage of the strategic attributes of space power — perspective, access, presence, and extended strategic depth — that offers economic and strategic benefits beyond mere prestige means. DubaiSat-1 and DubaiSat-2 could revolutionize the land and resource use as well as urban planning that benefit the UAE and the region. The UAE has the potential to be a major space player in the Gulf and the wider Middle Eastern region. R. Y. Tsai and T. S. Huang, “Multiframe image restoration and registration,” in Advances in Computer Vision and Image Processing, vol. 1, chapter 7, pp. 317-339, JAI Press, Greenwich, Conn, USA, 1984. M. Irani and S. Peleg. 1991, “Super Resolution From Image Sequences” ICPR, 2:115–120, June 1990.